QuotePak was written with the Owner, Foreman & Programmer in mind. When having to quote a stack of prints along with a few thousand other things to do in one day, speed and accuracy are important. QuotePak's speed is based on simplicity. All functions are controlled with command buttons, prompting input boxes to accumulate data. The results are posted as soon as they are calculated. It's accuracy involves your skill as a machinist to determine the feeds and speeds you will use to program the job when you get it. When you get the job, simply reference your quote report for speeds and feeds to setup the part. You will have a target setup time, as well as a target run time. For scheduling purposes you will also have machine hours. 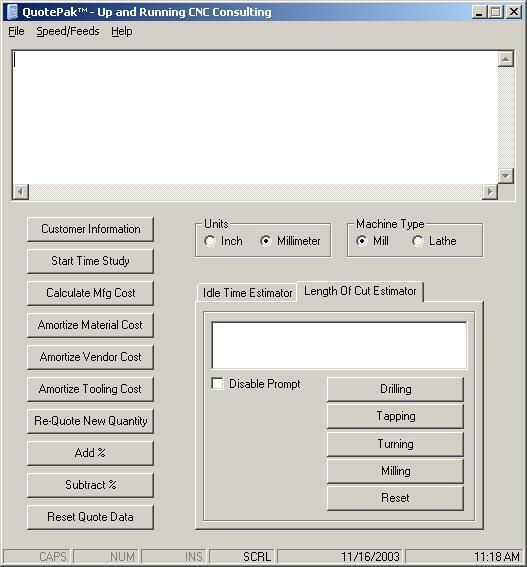 Up and Running will also write any custom software for your manufacturing needs. Our goal is to provide and create affordable, simple, task oriented software.